Don’t wait for a chalkboard or chalkwall, START TODAY. This Kit features everything you need to create your own stunning chalkboard pieces without getting yourself covered in white dust. Ever since picking up the iPad Pro and Apple Pencil my favorite style of lettering has to be chalk, because of how creative you can be with the effect chalk gives you. This pack has been made using actual chalk textures to give the most realistic looking set of brushes that you'll find for Procreate. 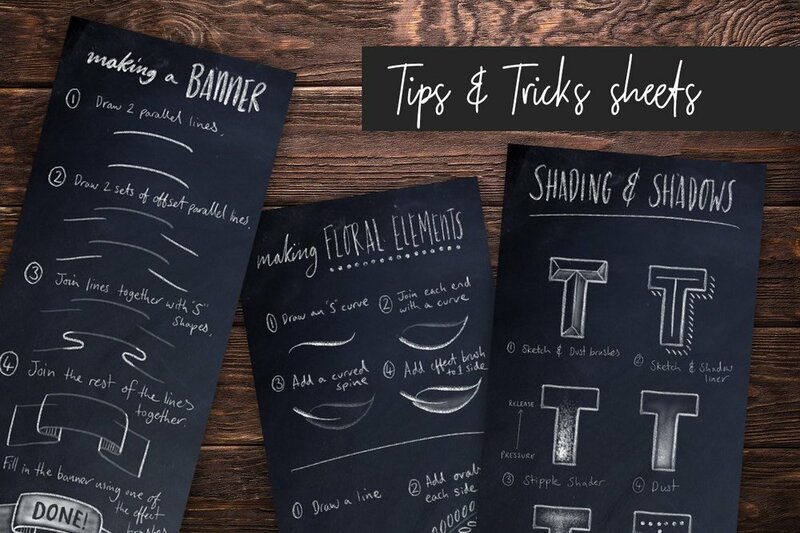 You also get a tips and tricks guide sheet to show you how to do things like shadows and shading and drawing elements like banners and floral elements. Apple iPad with OS 10/11 Apple Pencil or similar stylus Procreate App version 3 & 4 (found on the Apple App store) Support: If you experience any problems not found within these instructions then please reach out to me via my contact form. Save the zipped file to your desktop, uncompress it and then add the items to your iCloud drive to be able to access on your iPad. If you are downloading straight to your iPad then install the free app "FileExplorer Free" onto your iPad first, then you'll be able to open the zip file. Please watch the below video to see how to add multiple brushes at once, as Procreate doesn't have this feature and so a work around is needed otherwise you'll have to import them one-by-one.